I am so excited to share about this school opening with you all! Last summer, my consulting team worked tirelessly (literally several all-nighters pulled) to help write a charter school proposal for an arts-infused elementary/middle school in Florida’s Glades region, a more rural and underserved community in western Palm Beach County. We took on this project because we believe Covenant Arts Academy’s unique, holistic approach to education will increase engagement, academic performance, graduation rates, higher-ed participation, JOY, and HOPE for students in this area… results that were already being seen through the school founders’ arts-based after-school program, Street Beat (http://streetbeatincorporated.org/about-us/). This morning, we learned that the charter was approved unanimously! I am thrilled for the Glades community and for the students that will benefit from this innovative curricular model. My biggest takeaway from this experience: If you have a vision for helping students in a unique or innovative way, share it, explore it, build a team around it. Diverse students need diverse solutions… maybe you’ll be the next one to bring hope to students who need it most! “The [Palm Beach County School Board] considered a third charter, Covenant Arts Academy, vital to filling a need for some of the county’s most remote students. Board members agreed, approving the school unanimously. Digital Storytelling with Animated Powerpoint – 100,000 Youtube Views and Counting! In 2011, some of you were there with me when I gave my first conference presentations to standing room only crowds at both FETC in Orlando, FL and in Philadelphia at the ISTE Conference. The presentation was titled “Elementary Media Projects You Have to See to Believe!” and it never failed to live up to the hype. With innovative project ideas and inspirational student work samples, student-created media was (and is) one of my favorite things to speak on. It’s truly incredible what even our youngest students can do! 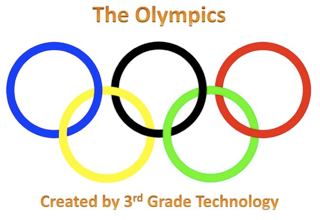 Click to view student-created example! One of the most popular projects from that presentation was the use of animations in PowerPoint to create digital storybooks that played like an animated movie. This type of project supports reading, writing, fluency and editing. It helps students to think and write with all of their senses and to experiment with various concepts of spatial thinking. Plus, it actually serves as a great precursor to computer programming through the use of strategic design thinking in executing both linear and parallel animation sequences to accomplish different visual effects. And the kids just love it! To support my own students, as well as the other students and teachers who started experimenting with this type of project, I created a set of tutorial videos that walk through each step of the process. I then hosted them on YouTube so that teachers could embed the tutorial videos into their own school and class websites to share with their students. Since then, countless numbers of student created projects have followed…. along with this week’s 100,000 viewer milestone for the full tutorial on YouTube! I wanted to share this momentous milestone with each of you who have used and shared these resources. Your efforts to give your students voice and purpose are commendable… and it has brought me great pleasure to provide this and other resources to the incredible ed-tech community over the last few years! And if you are new to this idea, below you can find the video and some information about using it in class. You can also learn more about innovative ways to use PowerPoint and other student media creation tools in the Interactive Student-Created Digital Media Portal in the site’s Resources. Happy creating, learning, and teaching! Kids love illustrating their stories. Using clip art in PowerPoint is a great way to allow our young students to create complex illustrations for their writing and stories without depending on their ability to draw them. And the best part? When they’re all done, these animated storybooks actually play like a movie. The Storyboard – Before beginning to create the animated illustrations, students should either write their rough/final drafts of their story or voice overs… or at least have a decent flow map story board or what happens in each scene. Narrative stories/essays, Flow Maps, CBBC Me & My Movie “How To” Booklet or the Script Frenzy Young Writers Program Resources are a great help for students during this step. Create slides using the following tutorial video. You can also embed this video into your own teacher website to use with your students. Have students save their work often. At least once every ten minutes. This video and/or the step-by-step tutorials below can be linked/embedded into your class or school website. Inserting clipart – All backgrounds and clipart should be inserted as movable objects. Objects that come in and out of the scene can be placed outside of the slide. Also, let students use creative problem solving to “crop” clip art to get one piece of a larger picture. Custom Animations – When creating the animations, instead of using “after previous,” set all animations to happen at the same time and then use the time delay to make them happen over the span of the slide. If you don’t do this, the animations won’t run at the same time as the narration after they are recorded. And for some mind-blowing inspiration, check out some of the work at the PowerPoint Heaven website! Video Tutorials – To use with your students or embed into your own site! – 3D Ladibug Document Camera: This dynamic document camera is able to perform all of the basic tasks of a traditional document camera. Plus, it can show objects and manipulatives in anaglyph (red/cyan) and stereoscopic 3D (passive or active) by using the 3D software. In the 3D Ladibug pilot, elementary students were more engaged in lessons and more interested in creating models to use when presenting to the class, creating a more hands-on and collaborative learning environment. – Presente3D: Most elementary students begin learning to use Microsoft PowerPoint at an early age. When I was a K-5 Technology Specialist, we started using PowerPoint successfully with our first graders. Presente 3D is an add-on to Microsoft PowerPoint, allowing the students to turn their presentations into anaglyph or stereoscopic 3D! By giving students the power to create and present in this intriguing platform, we can increase attention and motivation with our students. Their website offers a free download of Presente3D in demo mode – a great to try out its potential! – Kid Pix 3D: While Kid Pix has been a staple for student digital artwork for several years, the new version of Kid Pix allow students to create both images and videos in anaglyph 3D. There is even a way for students to record their faces inside of digital costumes, putting themselves right into the 3D action. Kid Pix 3D offers a 15 day free trial of their software here. 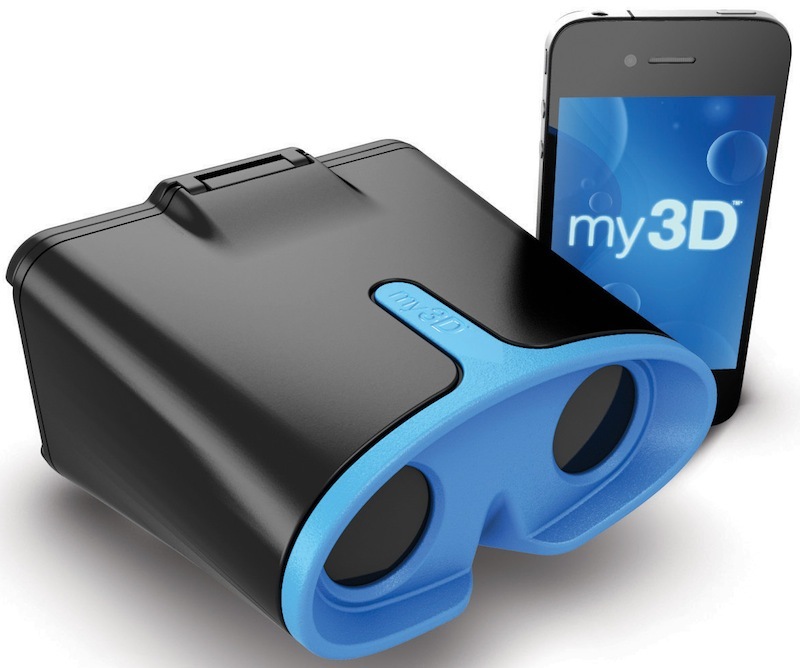 – Hasbro My3D: This nifty gadget turns your iPod Touch or iPhone into a 21st Century View Master. By downloading compatible stereoscopic 3D single-player games and interactives, students can have the sensation of immersive experiences like traveling through the Solar System or swimming with sharks. – 3D Books: Books with anaglyph images are popping up everywhere… and students are captivated by both the pictures and the content. Topics range from space to geography to animals. Look for them at your local bookstore or even the school bookfair. A couple of my students’ favorites are Eye-Popping 3D Pets and Extreme 3-D: Dangerous Animals. There are so many ways to get started with stereoscopic 3D in the elementary classroom. In addition to these 5 easy-to-get-started resources, there are also great stereoscopic 3D video clips, simulations and interactives available. Look for future posts with more information and recommendations! Nancye Blair Black is an award-winning educator, speaker, author, and consultant. 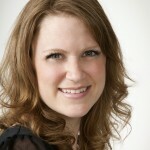 She is the Founder and Chair of ISTE’s Special Interest Group for 3D in Education (iste.org/sig3d) and recently published a chapter on 3D document camera use in the IGI Global book, Cases on 3D Technology Application and Integration in Education. Transforming Students to Authors: National Novel Writing Month (#nanowrimo) starts today! In my eight years of teaching, rarely had I encountered a project that gave students as much ownership and motivation as the Young Writers Program for National Novel Writing Month… Or as lovingly referred to by its participants, NaNoWriMoYWP. Today commences the 2012 month of novel writing. Students around the world are choosing a personal word count goal and launching on an adventure to tell a long narrative tale by November 30th. Not only does this project significantly boost the quality of student writing through hours of deliberate practice and give amazing opportunities for powerful writing mini-lessons that students can immediately put into practice, but NaNoWriMoYWP also provides an appropriate learning environment for demonstrating to students the power of setting and working toward a challenging goal. 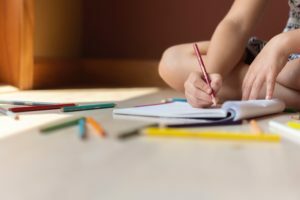 Completing one’s first novel at the age of 8, 12 or 16 is something that belongs wholly to that student and can never be taken away. It represents a lifelong transformation from writing student to author. The message of empowerment is undeniable. Click to download .pdf version. So, I encourage you to take join my students, colleagues, friends, writers around the globe and me in taking the NaNoWriMo challenge in 2012. Just because it is November 1, doesn’t mean it is too late to jump in. 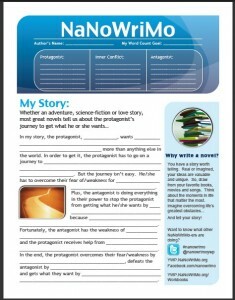 In fact, I am attaching a .pdf adapted from NaNoWriMo materials that can help you shortcut your planning time, turn your ideas into a true story concept and even connect with other NaNoWriMo-ers. Plus, this month, I will be continuing to share writing resources, tips and student stories to keep your writers engaged and motivated along the way. So, take the challenge yourself, integrate the program into your reading and writing instruction over the next month, or at least send a Twitter message to the many students on their way to becoming authors! Let the novel writing begin! 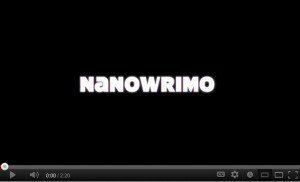 Click here to read more about our 2011 NaNoWriMo experience!